So following on from our piece on how to raise goats as part of a self sufficient lifestyle, we are going to look at how to make soap from goats’ milk! 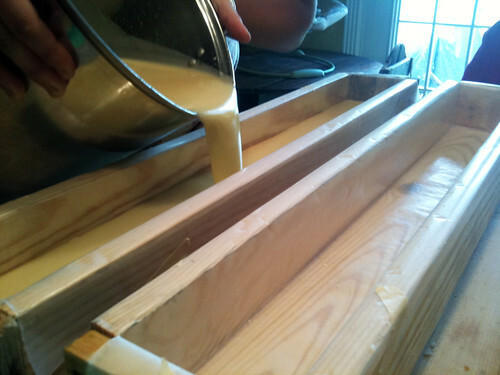 Why Should You Make Goats Milk Soap? Soaps using a goat milk base are creamy and leave your skin feeling silky smooth. 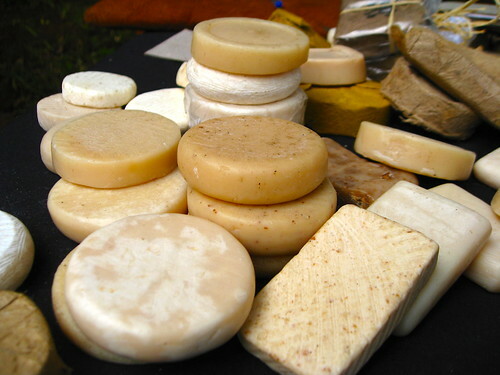 Many people have claimed that their allergies or acne have gone away completely since switching to a goat milk soap. Real soap leaves your skin feeling great while actually getting you clean. What Do You Need to Make Soap? No matter what recipe you use generally you will use the same equipment. A large stainless steel pot is necessary for making your soap if you are using the cold process method; if you are using the hot process method then get a large crock pot. A number of measuring bowls will be used while making your soaps. Many soap makers will tell you that you can use glass or stainless steel. Glass equipment is great if you’re strapped for funds, but stainless steel will hold up better in the long run. An accurate scale is a must have for soap-making. Digital scales are better to use than traditional ones and a scale that measures in ounces is a blessing. You will need something to mix with. If you are in desperate need of a work out wooden spoons will work, but it can take up to an hour of continuous stirring for your soap to trace. A nice stick mixer will get your raw soap to trace in less than ten minutes. You will need a mold for your soap. Wooden loaf molds are popular because you can cut your soap to size, but they can be pricey starting at about forty dollars for a two pound mold. Have freezer paper on hand to line the mold and your counters. Finally, be sure to have vinegar on hand at all times. These are the items that people think about when getting their stuff together to make soap. What is more important are these items that they don’t think about. Be sure to wear old clothes that are long sleeved and have long pant-legs. Old tennis shoes are also a good idea. You are going to be dealing with caustic substances that can burn you fast and severely if you get them on your skin, they will ruin clothes too. Be sure to have gloves to wear. Some soap-makers will use heavy duty rubber gloves, but disposable gloves are also a good choice. Goggles or glasses are a good idea to protect your eyes from splashes. If you are making one or two batches of soap a year then you shouldn’t need a mask, but if you are planning on making three or four batches of soap a day then it is a good idea to buy a mask specially made for use when dealing with sodium hydroxide. A good recipe for soap is a necessity, but it can be hard to find. Most people end up having their own recipe and don’t tend to share it. 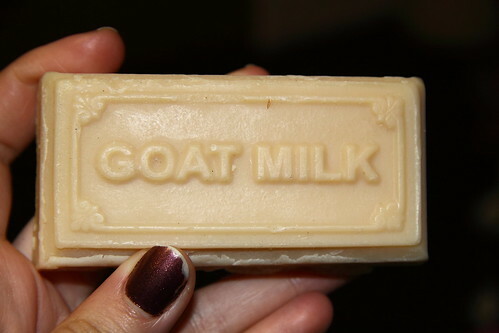 You’ll find a lot of bad recipes when you Google goats milk soap. Luckily, a bad recipe is easy to spot. If it is not measured by weight then do not use the recipe. Volume changes easily and some oils are heavier than others, so always use a recipe based on weight. If you want to create your own recipe soapcalc.net offers a great lye calculator. Even if you find a decent soap recipe on the internet it is always a good idea to run it through the lye calculator to make sure it is a safe recipe. Many soap-makers just replace the water in recipes for milk, the more accurate way to do it is to plug in the weight of your milk protein. For every ounce of goats milk that you use do the math to put about four percent of that weight into the lye calculator as milk fat; put the rest of the milk in as water. Remember, the fewer oils that your soap recipe uses then generally the cheaper it is to make. So How to Make Soap from Goats’ Milk? First and foremost, clear all children and pets from the room. Keep them out of the room until you are done making your soap and all of your items are put away. Start by measuring out all of your oils and pour them into the pan or crock pot. If your scale has a tare function then it’s fast and simple to use the same bowl for measuring all of your oils. It is generally easier to measure the solid oils before the liquid oils, so you can reuse the bowl for at least one liquid oil. If you are making cold process soap put your pan on a burner and heat it up just enough to get your oils liquid and then turn it off. If you are making hot process soap turn your crock pot on low now. Ideally you would have measured out your milk earlier and frozen it in ice cube trays; if this is the case put all of your pre-measured ice cubes into a large bowl. Add the lye (sodium hydroxide) slowly while stirring. Be sure that your windows are open because if the reaction is happening correctly it is going to smell and the milk will melt and turn yellow. Many soap-makers use their milk while it’s at the slush stage; since there is a small amount of water in my recipe – I have never had a problem using it completely frozen. Once you have your lye milk the next few steps are going to go pretty quickly and you’ll soon be finished if you’re making cold process soap. Pour the lye-milk into your liquid oils without splashing them; a good practice is to have the bowl facing away from you when you’re pouring. If you are stirring by hand start and do not stop until your soap looks like pudding; this can take up to an hour. I averaged forty-five minutes of stirring when I did it by hand. If you have a stick blender then get it and start blending. Try to keep the blender under the soap in order to keep as much air as possible out of the soap. The soap should become the consistency of pudding, called trace, within five to ten minutes. What is Next – The Cold and Hot Process? Once your soap has reached trace in cold process now is the time to add fragrances and colorants. With fragrance just pour it in all over the pot (in the amount your recipe calls for) and stir in. After the soap is scented you can color the entire soap or just part of it. 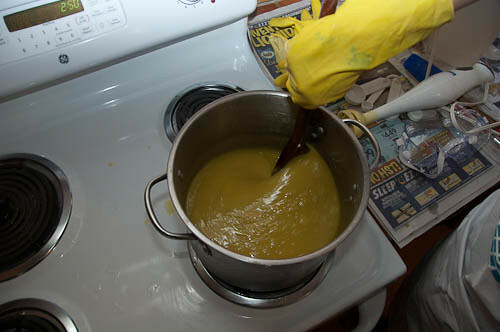 To color the whole soap put the colorant in the pot and stir well. Be sure to have reduced the amount of water in your recipe by how much colorant you used, this is the reason I like to have at least a little distilled water in my recipes so that when I do have to reduce my liquids I am not reducing my milk and its helpful properties. If you would like to swirl in color separate one fourth or half of your raw soap into a bowl. Add the colorant to the bowl and stir well. Add the bowl of colored soap back into the pot by pouring it in four different spots. Stir it with a wood spoon once or twice and then pour your soap into your freezer paper lined mold. If you are making cold process soap you are done. Let it set 24-48 hours, cut it, then set the soap somewhere to cure for five weeks. Your soap will still be a little caustic when you take it out of its mold, so be careful. If you are making crock pot hot process soap put the lid on the crock pot once it has reached trace. I use a wooden spoon to stir the soap every ten minutes. The soap will first go hard then the oils will start rising to the top. Stir if you can during this phase, but don’t freak out if you can’t. Soon the soap will look kind of frothy bubbly around the edges and start moving towards the center. Stirring every ten minutes has worked well for me; stir now if you can. In the next phase of the process the soap will begin to look like apple sauce, this is a good thing it means you’re more than half way done. As your soap is coming out of the apple sauce phase and going into the mash potato phase keep a close eye on it. It can decide to start expanding up the pot, if this happens stir like crazy and turn down the heat. It will bubble out of the pot if you let it. Every time I have had a bubble up it has been in the mash potato phase, which is where the soap is done. If you are adding fragrance now is the time and you should be using about half the amount of fragrance oil than you did with the cold process soap. You have to almost double the amount of colorant for hot process soap than you use in cold process. This is because the hot process scalds the milk into a darker brown that the colorant has to overcome. You can swirl hot process soap, but it doesn’t look as nice as color process soap. 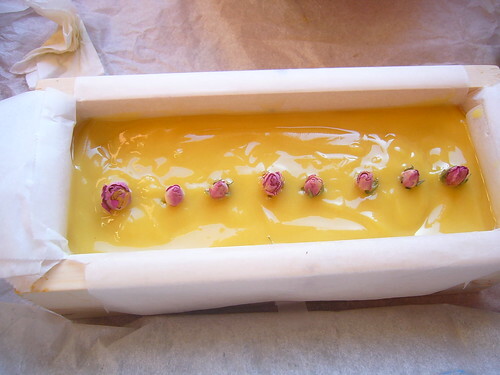 As soon as you poor your soap into the mold and it cools it is safe to use. The cold process of soap making is better if you want pretty soaps. The hot process is better if you need your soap fast or have no place to set it to cure for five weeks. There are more cold process soap-makers than hot process for some reason, but both methods of making soap work. When pricing your soap the best method is to figure up your costs per a bar and multiply that by four. The biggest mistake that soap-makers make is that they don’t charge enough to even cover their expenses, then they end up going out of business. Every bar of soap that you put out should have the name of the farm or your name, the address, and the phone number – also you should include an ingredients list as well. Every soap-maker is different and will give you different advice. You will find things that work for you that might not work for someone else. While soap making is a science it’s also an art and art is always an individual experience. So when you are thinking about how to make soap from goats’ milk, my suggestion is jump in! I have just started making goat milk soap, there has been so many variations in color in the base with the milk and lye. Could you please tell me if I do the same thing over and over, why is the color so different. I was told if the base color is a dark yellow then is had gotten to hot. I used a temp so that it wouldn’t go over 110° Thank u for your time.